Added by Debra Tash on August 4, 2018. 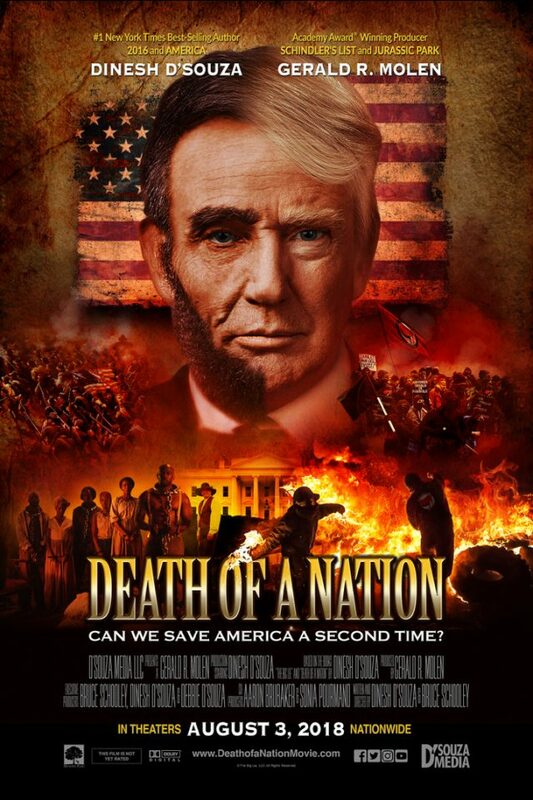 On July 30th, I attended the Los Angeles premiere of Dinesh D’Souza’s latest documentary “Death of a Nation”. The conservative writer and filmmaker’s latest political exposé links fascism and racism to Progressive Left, and thus to the Democratic Party as whole, not does just focus on Hillary Clinton or the Democrats’ current descent into the socialist abyss. In his previous documentary Hillary’s America, D’Souza determined to end the Big Lie that the two major parties switched. Liberal media and academia had long argued that even though the Democrats had favored slavery and white supremacy, they have become the party of civil rights, switching roles with the GOP. This comprehensive project comes on the heels of D’Souza’s others films, which revealed Barack Obama’s background and ideology, the 44th president’s transformative vision for the United States, and the Obama-Clinton progressive agenda to come with Hillary Clinton. “Death of a Nation” shows how the Democratic Party’s program of “you work, and I eat” socialism has long-defined the Democratic Party, along with its racism. Furthermore, D’Souza outlines how the fascist movements in Western Europe before and during World War II were iterations and adaptation of socialism, and thus movements of the political left, not of the right—and that these fascist governments drew their most sinister ideas from the United States’ Democratic Party. This revelation—that fascism is left-wing, not right-wing—is still a shocker. It’s almost holy writ from high school to graduate school that the fascists were right-wing, and the socialists left-wing. When I was a sophomore in high school, my World History teacher had fashioned the political spectrum in the form of a horseshoe, with the twin tyrannies of communism and fascism closely posed together at the tips. D’Souza creates a more accurate picture of this debate and clearly demonstrates that Mussolini and Hitler—and all other fascists—were left-wing ideologues embracing socialism in every facet of society. D’Souza’s narration moves quickly through recent history, relying on dramatizations, documents, and interviews with academics and pundits to showcase the connection between slavery and socialism. Focusing more on the ties between Nazi Germany and Fascist Italy with the Democratic Party’s progressive wing, including statist Franklin Delano Roosevelt, and before him Woodrow Wilson. Indeed, both the Democratic Party and the fascist in states shared a common commitment to massive growth of the state, diminution of the role of the individual liberty, plus a perverse commitment to a centralized state for the perfection of society and humanity. D’Souza displays these powerful revelations on the silver screen in dramatic detail, describing how Hitler’s Nazi regime reviewed the Democratic Party’s domestic terrorism and segregationist programs against American Indians and then blacks in the South. They drew inspiration from the Democrats for their own racial policies against Jews and other ethnic groups in Germany, then against other conquered peoples throughout Europe. Surprisingly, the violent, vile Nazis found the Democratic Party’s “one drop rule” to define someone as “black” too harsh, too racist. Other uncanny revelations about Hitler’s true views on Christianity (he was no Christian, but used religion to subvert the public) and homosexuals (he welcomed them into this thug operations, but executed their leader because he threatened his political power, not because of his personal life) will shock viewers across all political persuasions. This documentary is true historical revisionism: not telling lies to push a narrative, but a work which shines the light on decades of lies and cover-ups, all drawn up by American progressives to protect their statist (and racist) agenda. One of the most compelling interviews occurs with the notorious White Supremacist and supposed Trump supporter Richard Spencer. To hear this atheist alt-right spokesman’s true views will underscore the fact that racism, white supremacy, and socialism have a closer kinship than they do with free markets, free enterprise, free people, and the Republican Party. While D’Souza, a former Reagan White House staffer, draws a few similarities from President Trump to his former boss, he takes more time to connect Trump to the longer, more storied legacy of America’s first Republican President, Abraham Lincoln. Like Trump, Lincoln won the Electoral College without winning the majority of the popular vote. Like Lincoln, Trump faces a bitterly divided nation fractured along increasingly regional lines. Like Lincoln, Trump’s political opposition is composed of violent, deranged, socialist-leaning Democratic Party. The opponents of liberty, then and now, have resorted to enforcing silence and violence against American patriots, conservatives, and Republican office holders at every level. This documentary has only two problems. The first, that D’Souza needed to spend more time comparing the first and the latest Republican Presidents. This limitation stems from the larger problem: D’Souza has to tell us so much within one and a half hours, it’s almost like digesting an entire history book in one day. There is so much to tell, so many left-wing lies to debunk, so much misinformed history to correct, that one can hardly scold D’Souza for attempting to share as much as he can with his audience with the little time available.